You know how in Illustrator it’s a total pain to shade your work or add textures? Especially when you need to get in tight corners. It always ends up being an elaborate process. I know when I do it I feel like I’m trying to be the MacGyver of Illustrator to make it work. This pack was made by Von Glitschka (author of Vector Basic Training, most-viewed instructor on Lynda.com, professional illustrator for clients like SXSW, Adobe, Nike, Planters, Wendy’s, Dungeon & Dragons, and tons more). Von Glitschka spends 50+ hours a week illustrating (and a lot of that time is in Illustrator). Being the smart designer that he is, he’s invented time-saving tools for himself. 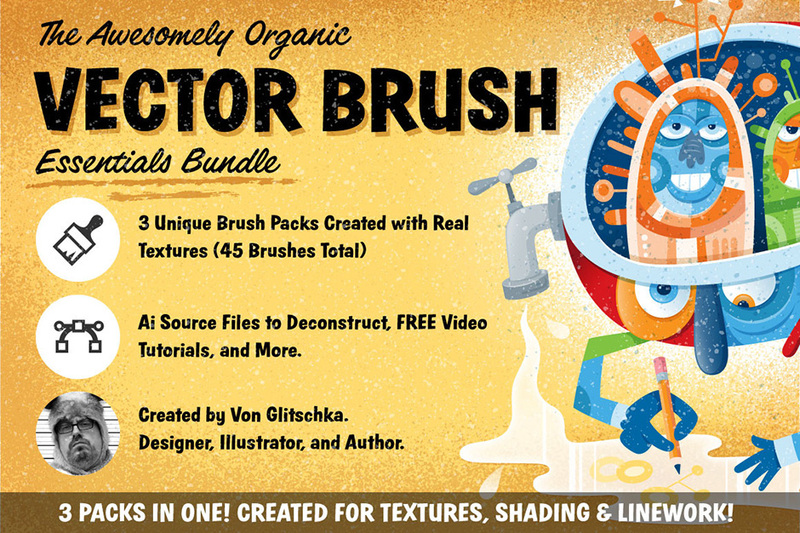 The great news is that The Awesome Organic Vector Brush Essentials Bundle includes three of these tools (and so many extras your head is going to spin). These are my favorite brushes in the pack. You get 15 shading pattern brushes. These brushes give you that rich textured shading look. But the best part is that they’re only textured on one side! That means you can easily use them on edges of shapes and not have to deal with trying to mask the texture on the other side. For example, look at the tribal illustration in the before and after image. It looks pretty good with clean crisp lines. But being that it’s a tribal design it would make sense that the lines aren’t so sharp and crisp. Plus, since each of these packs includes 15 brushes you can try out all sorts of different variations. It’s literally as easy as flipping through channels on tv. Studies have shown that when people physically do things they learn better. That’s why we’ve provided .AI files of the artwork. By giving you access to professional illustration work you can “look under the hood” and quickly understand how stuff works. You’ll be amazed at the kind of tricks you’ll pick up in minutes (not hours) of look through these files. By the way, these aren’t simple illustrations- we’re talking about full blown complex illustrations with shading, textures, gradients, blending modes, and more. Want to learn step-by-step how a pro uses these kind of brushes? Then you’re going to love these 3 tutorials from Von. In each tutorial Von shows you the exact way he uses these brushes in his work. I think you’ll be amazed by what you can learn from the tutorials. What makes these tutorials so great? Well, first of all you’re learning from an illustrator that produces world-class illustration work for some of the biggest companies in the world. But more important you’re learning from someone who is a fantastic teacher. File size is approx 724.3MB (930.3MB unzipped), offered as a single download.